Skip the crowded Brunch lines and make these fun and easy Pumpkin Spice Vegan Waffles with pecans at home! And don’t forget to make extra, because this Fall-inspired breakfast doubles up for the perfect FREEZER WAFFLES! As soon as October hits, we all start to crave the flavor and smell of pumpkin. Even though canned pumpkin (which is what most use) is available year round. It’s the excitement of pumpkin season, visiting pumpkin patches, carving pumpkins during Halloween, and all the delicious pumpkin recipes! Us San Diegans need that pumpkin smell and flavor to make us feel like it’s actually Fall since it’s still a whopping 80 degrees here this entire week! Can you believe it? 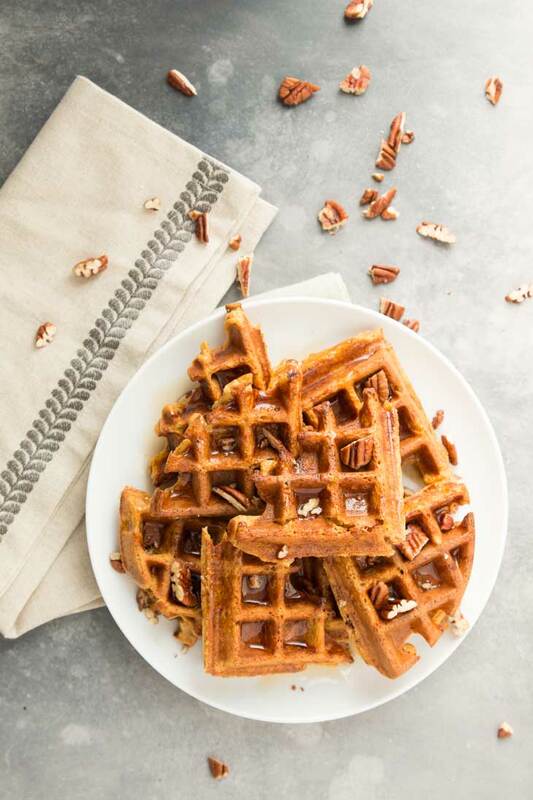 The pumpkin craze in our house officially began with a batch of these delicious Pumpkin Spice Vegan Waffles topped with pecans! It’s been our weekend breakfast go-to this month. This pumpkin vegan waffle recipe is adapted from my Apple Cinnamon Waffle recipe. 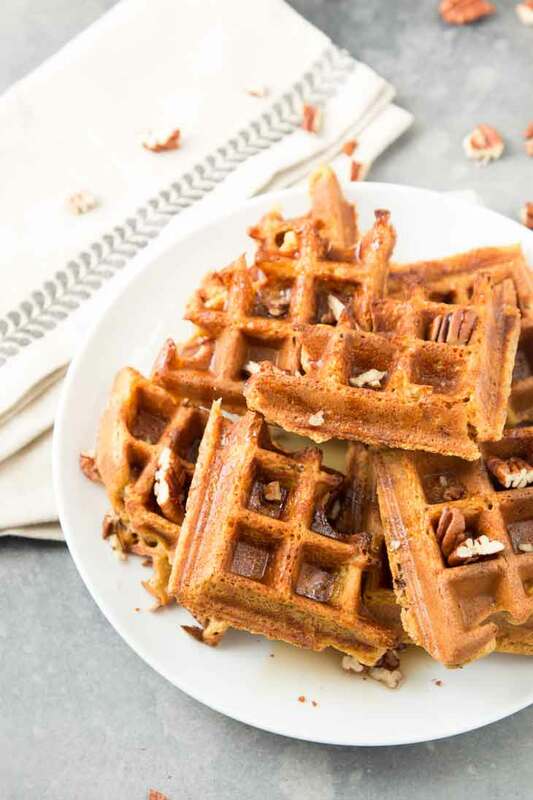 The subtle flavor of pumpkin made into a crispy waffle and topped with chopped pecans to give it that extra warm Fall flavor and crunch. These pumpkin waffles make for the perfect fun and easy family breakfast! These pumpkin vegan waffles come together in just 5 simple steps! I kept this recipe simple by splitting it up into wet and dry ingredients. I highly recommend getting a double Belgian waffle maker so you can make two at once and aren’t waiting around! Trust me, you’ll thank me later when you start smelling that Fall pumpkin spice flavor in your kitchen. I haven’t even gotten to the best part yet! This recipe makes the BEST FREEZER WAFFLES! Make extra, allow them to cool completely on a cooling rack, and freeze them in a sealed container for a quick healthy breakfast. Just pop the frozen waffles into a toaster oven until heated through and crispy again! 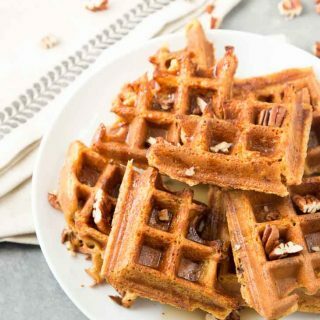 So skip the crowded brunch restaurants and create your own fun and easy Fall breakfast at home this year with these Pumpkin Spice Vegan Waffles! Need More Vegan Pumpkin Recipes? 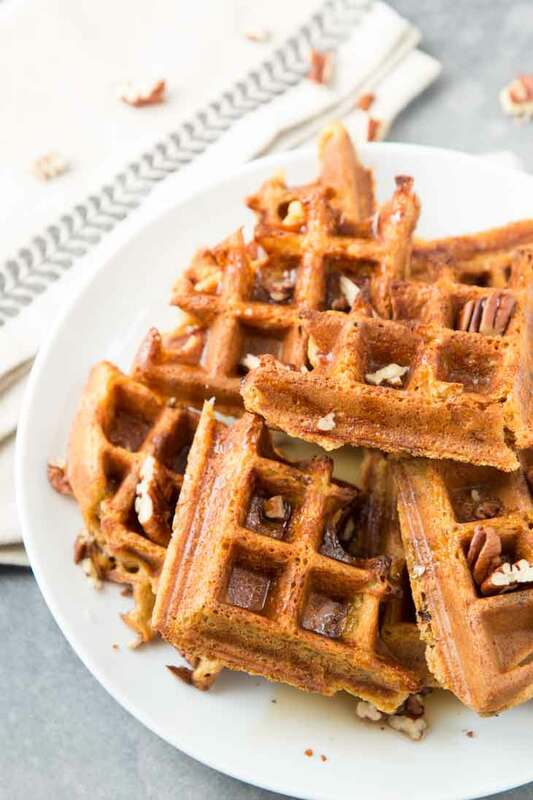 The pure smell of these pumpkin spice vegan waffles will have you in the Fall mood! The recipe is healthy, easy, and leftover waffles can be stored in the freezer! In a medium mixing bowl, whisk together all the dry ingredients. 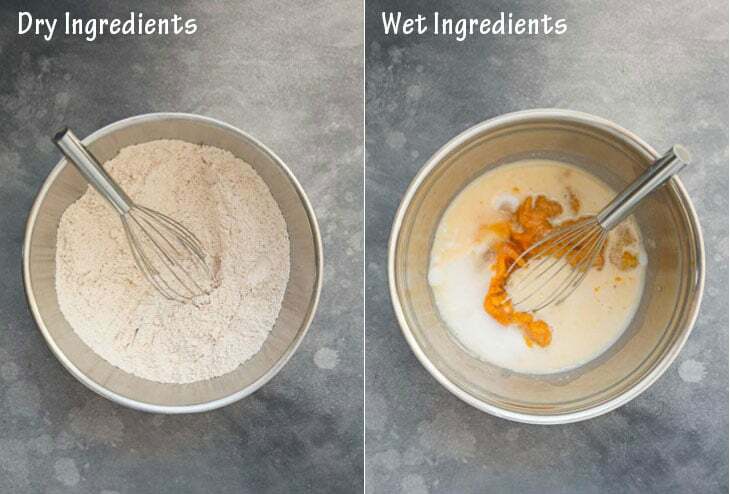 In another larger mixing bowl, whisk together all the wet ingredients. 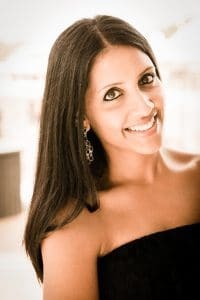 In small batches, add the dry ingredients to the wet ingredients, and mix until fully combined, being careful not to over-mix. Let the batter sit for 5 minutes as you heat your waffle iron to the desired setting (if you like your waffles crispy, set it to the darker setting). Once the waffle iron is preheated, spray it with a little non-stick coconut oil spray on both sides. 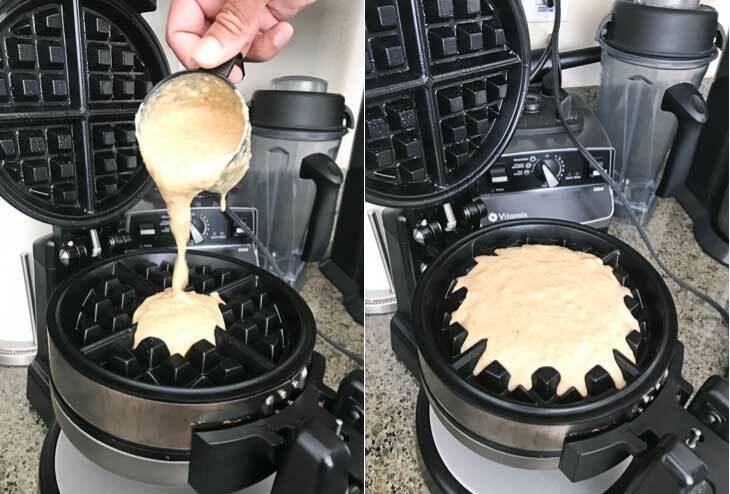 Pour in the correct amount of batter, as indicated by your waffle maker, to the center and close/flip, allowing the batter to spread. Cook until nice and crispy! I waited a little longer after the waffle maker indicated done. Top with some chopped pecans, vegan butter, and maple syrup. If you are not planning on eating the waffles right away, be sure to cool them completely on a cooling rack so that the moisture does not get to them and they stay crispy. To Freeze Waffles - These vegan waffles are perfect for freezing. Allow them to cool completely on a cooling rack. Seal in air-tight containers and store in the freezer. When you're ready to pull them out again, simply stick them frozen straight into your toaster oven or toaster (no need to defrost). Waffle Maker - I own and highly recommend this double-sided Belgian Waffle Maker. Great to see you're soaking it all in! I'm hoping to develop a recipe for pumpkin pie overnight oats with coconut whipped cream =) And yes, I finally got around to adding the nutritional info, glad it helps! I was trying to find a website that gave fairly accurate results when calculating. Thank you! We tired this recipe and everyone if my family loved it. I love all your waffle recipes. Love the fact that they are guilt free. Waffles are my favorite for breakfast, especially when they are guilt-free and full of good-for-you ingredients! Hopefully i'll come out with a few more flavors this coming year! Yay!! I knew you'd love them! Do you guys have easy access to canned pumpkin? 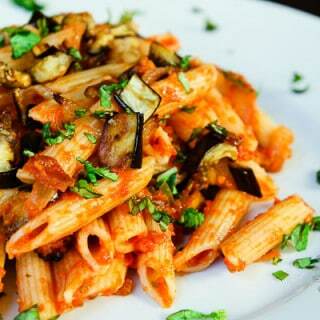 If so you must try out this recipe! It's so good and they freeze well! Yum!! 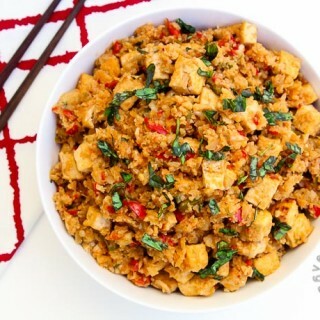 I want to try making this on the weekend - my first vegan recipe!! Yes!! Did you try it?? Hopefully, you did because it's so good! And made extra to freeze for later!